I have never been a fan of digital rights management software. Being an early adopter of ebooks, this kind of tech is the reason why I have lost many ebooks over the years because they are linked to obsolete tech, stuck in obsolete formats, or require the input of a password that I have long since forgotten. But I never expected that DRM would start to invade even the non-digital world. Enter Keurig's application for a patent for a coffee machine that will refuse to work with genetic "pods" of ground coffee. That's right. 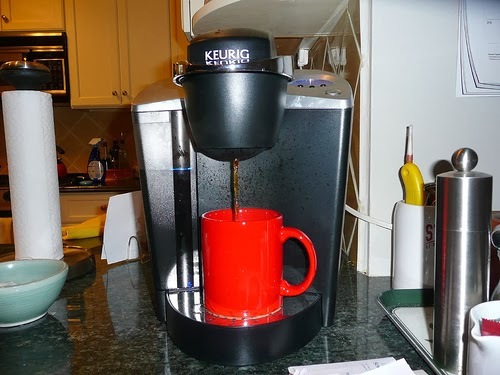 Keurig is DRMing coffee pods. Thus propping up yet another irrational market like computer printers that sell below cost so they can screw you over the price of proprietary ink cartridges. Coincidentally I was looking at replacing my hard-to-clean Keurig with a plain old drip filter by Mr Coffee (they have one that makes "lattes"). And I think this has just sealed the deal. I have an original Keurig and love the My-cap way of reusing pods. I also have a Senseo and will be getting a Perfect Pod maker (right now it's used for hot cocoa and oatmeal in the office, LOL!) so I can make coffee in my office since they don't really sell Senseo pods anymore. I have to say, I, too, will be moving to different options if I could never use my own coffees and make my own pods. Thanks for the heads up.